If you are anything like me, come March, you start to feel a pull… a pull towards doing the one thing that you said you’d never do when you became a teacher- teach to the test. 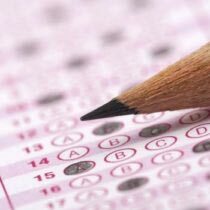 Sure, throughout the year you’ve talked about “the big test” with your class, showed them some helpful strategies, maybe even used a few multiple choice activities to use as warm-ups with your kids. However, there comes a day when you have to choose to spend your school day focusing on quality teaching or teaching to the test. So it is with that thought in mind, I present some test taking tips because after all, (sigh) test we must-so tips we need! As many of us do, I teach various literary genres throughout the year. I now treat test taking like it is another genre. 1) The Genre of Test Taking is Unique. This genre includes multiple-choice questions, and we need to know what type of questions the test is asking us. This is particularly important when we are practicing reading comprehension. After discussing inferring during Reader’s Workshop, we use test release passages and questions to determine if the question is asking us to: infer, go back into the text and find the answer, or both. If it’s a text question, we use a highlighter to highlight where we find the answer. If it’s an inferring question we know we need to use our brains and clues from the text to find the answer. This really helps students get comfortable with types of questions such as main idea/ and Author’s purpose. This is surprisingly easy for students to understand and apply. I have seen all levels of learners use this strategy successfully. As an added bonus, during the discussion of each question, students love to debate and “kindly disagree” with each other as they use their highlighters to support why they chose certain answers. 2) The Test Taking Genre has its own language. While we are practicing with test prep materials, we make sure to identify words we come across that teachers would consider “academic language.” (These words are usually found in test directions-and nowhere else in a child’s life.) I keep track of these words we find on a list. I assign a few students a day to look up these words in the dictionary and read the definition out loud. After hearing the definition and discussing the meaning, other students will come up with a “kid-friendly” explanation to post on the list, next to the “academic language”. This list is posted right next to our testing strategies list in the weeks leading up to the test. Words found on this list would include: determine, passage, comprehend, restate, and objective. 3) The Test Taking Genre is Tricky! When my students start to get nervous about the test, I let them know that I promise to teach them all the content that is on the test, and I promise to let them get comfortable with what the test looks like. This is where all those helpful strategies come in. We discuss and list all the regular ones: eliminating the wrong choices, a good answer vs. the best answer, etc. Here are some other quick ones to add to the list: During Daily Oral Language and test prep, we look for homophones that are commonly confused. Homophones like “their, there and they’re” or “two, to and too.” My students are taught to beware that these words might be used incorrectly. We use the “Jaws Song” to alert each other to a possible homophone mix up. 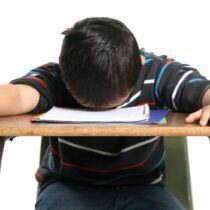 It is so cute to hear the kids start humming the tune in the middle of D.O.L (closer to the test, we discuss the many reasons why we don’t make noise, but keep it in our minds instead). Likewise we have a jingle for synonyms and antonyms (“Synonyms Same, Antonyms Opposite”) every time this concept is mentioned. It is these little routines that keep common testing material fresh in students’ minds. During math test prep, we discuss how the test makers try to “trick” us by putting an answer that is wrong on purpose. I challenge the kids to “outsmart” the test-makers, by finding the “trick answer.” I identify trick answers as the ones that are listed if a student has made a mistake; maybe a student added when the question asked them to subtract, or multiplied when they should have divided. They put a wink face 😉 next to the solution they believe is there to “trick” them. They enjoy finding the trick answers as much as figuring out the correct ones! 4) The Test-Taking Genre looks different from other curriculum! This year my wonderful partner and I realized that although our test scores were improving drastically- in one area, our kids were still doing poorly. It was in the area of Writing Strategies. We looked at the test release questions that dealt with writing strategies, and we realized that our kids do so poorly because we don’t teach writing in the way that it looks on the test! It was then that we created a plan. We gathered all the test release questions on writing strategies we could find. We created writing mini-lessons to teach during Writer’s Workshop that would correlate with the questions. After introducing one of these mini-lessons on Monday and having the students practice it all week, we finish the week off on Friday by displaying a test question and having the class discuss the answer. An example of this tip in use would be: teaching a mini-lesson on Monday about unnecessary details in writing, having the students edit their writing pieces specifically for these unneeded details all week long, and finally displaying a test release question on Friday that asks students to choose what detail sentence should be eliminated in a passage. Phew! By the time March is over, I feel like my students really understand the genre of test taking. Just in time too! Next up, teaching stamina in April! Nichole Rozakos has been a teacher for 5 years and currently teaches a 2nd/ 3rd split at McKinley Elementary in Burlingame, Ca. She credits her mother for her love of teaching. In her free time, Nichole likes to read, dance and travel. I use some of these test taking strategies in my small group during Reading. I’m teaching my second graders how to go back to the story to find explicit and implicit answers. They love using the highlighters. I have already seen a great improvement in their test scores. What a fantastic article! Teaching to the test is so frustrating, and the ideas presented here are wonderful! Thanks for sharing. This is a great article. Thanks for sharing your creative thinking. I love how you refer to test taking as a separate genre…because it is. Your tips will come in handy this next school year. This is a fantastic article! I have felt so much pressure giving the test and I know my students have felt tension/worry over taking the state test. These are practical strategies that all students will need to know. Teaching it as a genre is genius! These are wonderful ideas! I wish I had seen this article sooner. I can’t wait to use some of these cute ideas next school year! WOW! Really enjoyed this article. 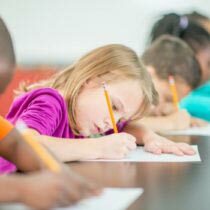 I had taught first grade and missed most of the test stress but this year I was moved to third and the testing anxiety hit hard! I am in the same boat, Margaret, with the Title 1 school and AYP pressures and this week we are taking retests and I think I am more nervous than my students! I have my notebook for next year of things to do differently and lessen the test anxiety for myself as well as my students. Love the idea of teaching “through” the test and not to it! I also swore I would never teach to the test but find myself in a Title I school, under pressure to make AYP, and we are “expected” to take the last week before the big test reviewing and drilling students for the test. The whole year I’ve been given 15-20 minutes daily to teach science and social studies (we alternate teaching science and social studies in two week blocks) because they don’t count for AYP!! I LOVE this article! As much as I wish I could just “teach through the test,” it’s not totally realistic to think that way, especially with younger students. They need to be familiar with the format, they need to be comfortable. Yes, content should be taught in a meaningful, powerful way, but the strategies presented here are not purely “test-taking” strategies. Asking students to identify “trick answers” is helping develop their critical thinking and reasoning skills. It really does take some higher order thinking to realize why an answer is wrong, and not just find the right answer. And the writing mini-lessons, it makes complete sense! I wish I had could have read this a few weeks ago! I totally have to disagree with a statement in the beginning of the article. Talking about how you have to “teach to the test.” NO NO NO! You should always teach “through” the test. I know that times get crazy at the end of the year and you are scrambling to make sure that everyone knows the knowledge needed for the big test, however, you should never sell youself short and teach to the test. Always teach through the test. When teaching through the test, you are still teaching the concepts the students need to know, but you are teaching them the next step. If you can successfully teach that next step, they are sure to get a grasp on the basic information and knowledge that will be on the big test! LOVE, love, love this post, especially the strategy of putting a winking face next to the answer meant to trick the kids! What fun. I am linking it to my responsibility activities page in my Taming the Testing Tiger column on our school’s website. Thanks, Nicole!